Would you believe that I've never actually see Wesna wrestle? Might as well make the first time live! Yes, I would believe that will be the case for most of the fans that will be there live at the next Shimmer show. The '07 Wesna highlight video is so badass, I cannot wait for this taping...She'll be there, Mercedes will be back, Lufisto as well, man this is gonna be so awesome! I've seen Wesna on RQW, LDN, and Zero One shows among other things. She is really good. 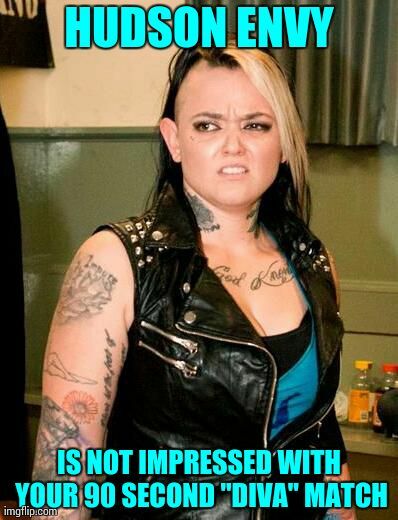 I'm looking forward to some new and exciting matchups she will bring to SHIMMER. My reaction to this video goes a little something like this. Loving that sweet looking STO at the 56 second mark! Aahhh!!! 2:20 check out that Yakuza kick holy crap!!!! Her finisher (starting at 3:45) is sick! Sick!! Thank you Dave! Thank you. I've not heard of or seen any of Wesna's work, but I'm glad I got my front row seats to check her out first hand! She's got a great look and looks like she can go. Dave always seems to bring in the best from around the globe! I only just realised that the link was to a new *2007* Wesna Highlight package - I figured it was the same video I'd seen before, but that turned out to be a hell of a little clipfest. Brought back some good memories of last year (the footage from ChickFight 8 was from the camcorder footage I shot for her), but there were also a number of clips from what appears to have been a three way between Wesna, Jetta and Blue Nikita - which is a match I'd very much like to see. Also, for those of you in the UK, next Sunday (Jan 13th) in Northfleet, Kent, I believe it will be Wesna defending the RQW Womens Title against #1 contender (and recently crowned WAWW British Champion) Jetta on RQW's "No Pain, No Gain 2008" show. I say 'believe' because it hasn't been officially announced, but Jetta laid out the challenge on the December show, so it should be happening. The rest of the card will be good, but Wesna vs Jetta for the belt will likely be worth attending just for that match. what kind of probs there ? The clip provided says it all. Annie Social: What Does that Even Mean!?! LOL "the Devil made me do it !" what is Michael Anthony's ????? Michael Anthony's is a restaurant/bar with nasty food and worse service. It's how we get our afterparty on. Okay, so can someone illuminate me as to what exactly the "Shimmer After-Party" consists of? It seems like there are a few people excited by the prospect - so, the ladies go there after the show to hang out? And eventually the fans who went to the shows decided to do the same? But there's actually little to no interaction between the ladies and the fans? Is this all correct? Anything else? I actually think the food is pretty good but the place is understaffed when SHIMMER takes over. I don't know about the origins of it, but I can tell you after having attended multiple tapings that most everyone from SHIMMER shows up and are generally happy to meet and talk with fans. Going there after the show is something that is announced at SHIMMER shows. I've had good conversations with numerous members of SHIMMER at MA's. Just don't be a jackass, don't be bothersome, and I personally don't approach them when they are actually eating.